Niedernsill is a village in the Pinzgau area of Salzburg. 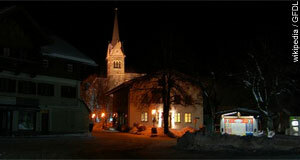 Niedernsill has its own small skiing area and a total population of approximately 2,500. For tourism purposes, it collaborates with nearby Piesendorf, with whom it operates the skiing areas and maintains some tourism marketing measures (such as a website and other promotional ventures). It is not an overly touristy community. The suffix "-sill" is derived from a Bavarian term referring to settlement. Niedernsill therefore means "lower settlement", as opposed to Mittersill ("middle settlement"). Niedernsill is situated by the local narrow gauge railway of the Pinzgauer Lokalbahn. It is also easily accessible via cars or - from the main valley of the Pinzgau, the Salzachtal - via public busses. Niedernsill also benefits a great deal from the vicinity to Mitternsill and the visitor centre of the National Park Hohe Tauern, which can be found there. The National Park offers many opportunities for Alpine sports in general, but "invasive" leisures are limited in favour of environmental protection. Hiking, mountain biking and various nature-related activities are great from Niedernsill. Otherwise, expect a medium-sized village with a friendly, Alpine and moderately touristy flair. With Zell am See and Kaprun, two of the Austria's major skiing towns are within easy reach from Piesendorf. Not only do these two towns make good bases for skiing all year round (thanks to the local glaciers), they are also noteworthy destinations for day-trips. Lake Zellersee offers plenty of water sport opportunities.